The exhibits have all the big names in the audio/live event industry. Shure, Sennheiser, Avid, Apantac, Optoma, and so many more. There will also be plenty of companies there that you will never have heard of, but after you see them, you’ll be wondering why you have not! Seeing the latest and greatest is one thing, but this is not just browsing a website or reading a review (like this). You get to talk to people from these companies that REALLY know what they are talking about. I’m sure we have all walked into a store, asked a question, and were given a dumbfounded look as a response. This is THE event for this industry, so the companies send out the best of the best to their booths to make sure your questions are answered. Meet these people, ask questions, start up a conversation, or whatever. These people know what they are talking about, and they are some great contacts to make. Most booths have a scanner, that when they scan your badge, your contact information is entered into their systems, and they can email you after the event. Prepare to get A LOT of emails. I am still using pens to I picked up from InfoComm back in 2011. Of course you go there to see the new technology, products, and network, but if it’s free, it’s for me. I gather tons of pens, hats, bags, shirts, and more. I even won a drawing and had a nice projector sent to me by Optoma (which is a great company by the way). Bring your business cards with you. Bring a lot of them. Many booths have a place where you can place them for a chance to win things. You never know. Some of What I got at InfoComm11. Pick up a bag first. You’ll need it. There are more possibilities at InfoComm then you may think. Like I said, last time I went, I was given a new projector. I also ended up winning a nice Leatherman multi-tool. Now aside from winning things and getting free stuff, you will meet some amazing people and see some new companies with great products. Without even knowing, I walked out of InfoComm in 2011 becoming an authorized dealer for Parts-Express. 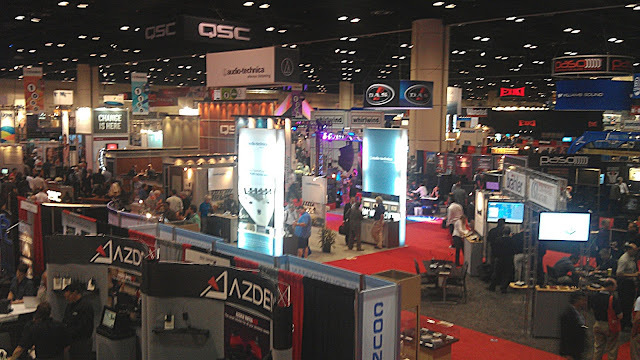 Regardless if you are in the industry or not, InfoComm is a great event that you should attend. Even if you don’t go to the conferences, walk around the exhibit floor and see what’s out there. You never know what surprises may await you. Visit InfoCommShow for more information about InfoComm13. Hope to see you there!